In most of the older and more traditional Indian houses, the commodes are Indian style commodes that require you to go on your haunches. While the Indian-style commode has its advantages, as we grow older, the western commode becomes far easier to use. While re-modelling the toilet is the best thing to do, it may not always be immediately possible to do so for various reasons such as the time taken, the dust, extended presence of workers in the house and budget. Under such circumstances it may be wise to use one of the portable western closets or converters as a stop-gap measure or even a permanent solution. There are several models available out of which the one below is quite popular. It is called the Rainbow-2 from Karma, a company head-quartered in Taiwan with a presence in over 45 countries around the world. 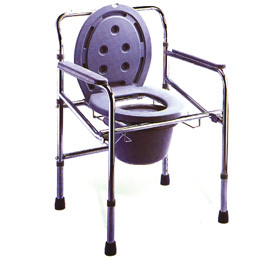 It is an elegant model with a silvery powder coated metal frame with high-grade plastic for the toilet seat, bucket and backrest. It is fold-able and hence easy to store as well as carry with you on travel. When not in use, it can be quickly folded without requiring any tools and shoved under the bed or behind the door. The whole apparatus is easy to clean and maintain. The bucket rests on a slider making it easy to remove and put back. Once the bucket is removed, the waste can be dumped into the available toilet and any residual excreta can be washed under the tap or using a health faucet. This apparatus can also be used as a toilet raiser in case you already have a western closet but find the original seat to be too low for you to comfortably sit and get up. Care should be taken to keep it in a dry environment when not in use, not splash water on it or keep it wet for extended periods of time and wipe clean after every use. When used and maintained properly this western commode can give you an extended period of painless service.